Okay so I put the suggestions to test and here is what I found. When I plug X and Y into the Z connections on the RAMPS board, they both work, while the two Z steppers do not when plugged into X and Y. My guess is this means that I have a bad board? I have already emailed Folger Tech and should have a response in the morning. Until then I don't have anything that I can do. I guess I can test the extruder and make sure that both it and the bed will come up to temperature while I wait to find out some answers. Again, thanks to those of you who have offered assistance! I'm anxious to get this up and running as there are several projects that I am ready to tackle! 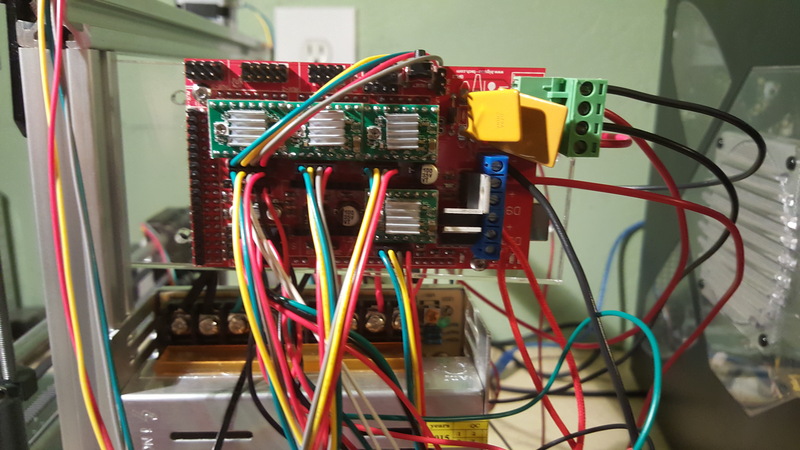 Check to make sure the jumpers are correct under the stepper drivers on the ramps board. Good point! You could be off one pin right/left. I just printed the 80 degree overhand test thingiverse.com/699366 It looks like anything over a 45 degree angle I get stinging underneath. How do I tune this to make it better? Last time I posted on this thread I was probably on page 10 or so. I had built the printer successfully and then didn't really use it. I hooked everything back up a couple days ago and started printing a whole bunch of tests and cubes. I notice that my print surface gets rough and has some gaps on the infill. I could be wrong but it seems to do this when the machine is getting hot. The x-motor is hot but not scolding. The y and z motors are cool. The extruder motor is piping hot. I'm not sure if this is because the hot end is touching the motor or not. I feel like the motors/drivers are very picky about a lot of build variables, and you need to adjust them all to your specific setup so the motors don't run too hot. Yes, everyone says "X-axis motor should be at Nvolts", but that doesn't take into account the tension on the drive belt, which can affect how hard the motor has to work. Best thing I've found for dialing in motors is to print a big calibration piece (like, one that takes 60 minute print time), and after 10 minutes, feel the motors. If one is hot, use the ceramic screwdriver and turn down the voltage a tiny bit (like a 1/12 of a turn, think of the dial on the driver as a clock). Wait about 10 minutes, see if the heat go down. Keep turning it down until the motor is pretty much room temperature. If the motor starts skipping, turn it up 1/12 again. It's a trial and error process, and will be different on everyone's build. I do not think that the hot end touching the motor is affecting the temp of the motor by any considerable amount. I am using a bowden setup with the original heatblock that would come in contact with the motor and it does not get hot as long as the fan is cooling the heatsink. The excess heat is most definitely coming from high stepper driver current. Try a smaller layer height (maybe 0.1) and possibly also a narrower extrusion width. These will cause less plastic to hang off of the overhang. Do you guys keep the fan on 100% when printing? Even with ABS? I was keeping it off because I heard that abs prefers no fan. Edited 1 time(s). Last edit at 10/29/2015 10:06AM by Uncertainty. Just got a FolgerTech 2020 i3 kit and sorted the screws and small hardware last night. I have a bunch of 25mm M3 bolts which I don't see on the list stuck to the outside of the hardware pack. Everything else seems accounted for, with extras even. I am assuming I'll use these somewhere? This is my second run at a 3d printer kit -- I already own a Cupcake, but she and I are a little on the outs at present. If the extruder is running backwards, all you should need to do is reverse the plug where it plugs into the ramps board. Just flip it over 180 degrees and plug it back in. Edited 1 time(s). Last edit at 10/29/2015 01:14PM by Bert3D. Here is a quick look at some of the recent things I have done to my FT 2020 printer. The enclosure has been really great, keeps the printer protected and clean from other work in the garage and help control the temperature better. Still have to clean up the wiring a bit and mount the LCD but I am happy with it. If you mean the fan attached to the heatsink on the extruder, you should be running that fan at 100% all the time, it's meant to cool heat come up from your hotend. If you mean an additional print fan blowing on the molten plastic coming out of your nozzle, then most people only us this for PLA. I will look into that once I get home... I was actually thinking about that this afternoon on my drive in to work... I also got an email back from Folger Tech and they will be sending me a new RAMPS board. I also realized last night that my solder job for the heat bed isn't very good, as I cannot get the bed to heat above 20 degrees Celsius. I'm going to tackle that tomorrow though. I have some other things that I need to take care of, and I want to get these steppers working. This. You shouldn't fix physical hardware problems with firmware changes. I was asked to post a picture of my board, so here goes... Still have to clean up all of my wires, but I won't do that until I get the darn thing working! Mine still looks a lot like that! lol. Nothing obviously wrong that I can see, except isn't one of those connections to the RAMPs board supposed to be inverted? I don't recall all of the connectors going in the same direction (despite what the instructions say). I'll go look at mine. I think it depends on the config in the firmware too - nothing to worry about yet. I have a question about the step sticks and setting the voltage. I wanted to turn the voltage down on the X stepper motor since it runs so hot. Since I lost my plastic screwdriver I checked the voltage, turned it off, turned it down, turned it on, etc. Maybe I was measuring it wrong (since I was trying to be so careful not to short anything out) but at last check it was down to 0.01v and not skipping. I started a print and it was working fine, and the motor was still getting hot. ??? I thought it should be around 0.4v. Thought you might be interested in a recent print. This uses an unusual filament called Biofila Linen which is designed to have a nice surface texture, and was printed using Slic3r's spiral vase mode. You can't tell the scale from the picture - it's about 65mm tall. Edited 1 time(s). Last edit at 10/29/2015 11:27PM by animoose. You evidently weren't getting a good connection to ground? Don't try to put the ground lead on the stepstick. Put it on the negative terminal on the power supply and then you only have to worry about a good contact with the pot. Thank you guys for the suggestions, I end up changing the connector at the Ramps board and now it's working as it should be!! I was able to complete a manual extrusion test... I set the printer to extrude 30mm and end up with 28mm, I guess now I need to find on the Marlin the steeps per mm so I can recalculate the values (did some one knows where is located in the code?). Yeah I know that must be the case, though I was using the ground from the power supply. I'll give it another go tomorrow. It is at line 484, or you could ctrl + F and search #define DEFAULT_AXIS_STEPS_PER_UNIT. This does work, that is unless you have somthing to tight or binding. You can be sure if you can't cool it down and get a smooth operation the problem is most likely not electrical but is a problem in the build . too tight or binding. Very good post therippa. A quick question guys, where can I find Pearl white abs or pla in USA? I have been looking but not finding USA supply. I messed around with the X-carriages that you guys linked. Ended up making a remix of a remix. This one has and end-stop pusher built in, just shortened up. Plan is to use the x end-stop that therippa linked a while back. Also added some hoops at the top to use for cable tying wires up to the carriage. my x stepper runs hot even with the voltage cranked down until it's just above skipping. I added a heat sink and a fan to it and it runs much much cooler now. There are also some prior posts from tjtnamtiw that show where he printed a fan shroud to blow cool air over the x stepper. Edited 1 time(s). Last edit at 10/30/2015 11:37PM by LancelotL. Does anyone know how to get Slic3er to provide a 100% fill underneath supports on the first layer to provide better adhesion with the support material? I can fix some of it by making my brim size really wid but it seems like there should be an option to fill the support material base. Some of my supports always seem to break lose because the default fill for attachment of supports seems to be 50%. Thanks!